Sometimes, an event in someone’s life can propel even bigger and better things later on. That happened to Justin Liberto two years ago, when he came to Las Vegas, entered a major event at the World Series of Poker, and managed to make the final table for the first time. Liberto ended up cashing in 4th place in the “Millionaire Maker” championship, which was a staggering accomplishment. He collected a whopping $400,000. The big boost to the bankroll and confidence propelled Liberto to play in more tournaments. This past season, he entered 8 events on the WSOP Circuit, made 4 final tables, and won 2 gold rings – one of the best returns on investment by any player on the national tournament series. In fact, Liberto won the “Best All-Around Player” at the stop in his hometown of Baltimore, MD (at the Horseshoe Casino), which qualified him for the upcoming 2014-2015 WSOP Circuit National Championship tournament, taking place at the end of July at Harrah's Cherokee in North Carolina. 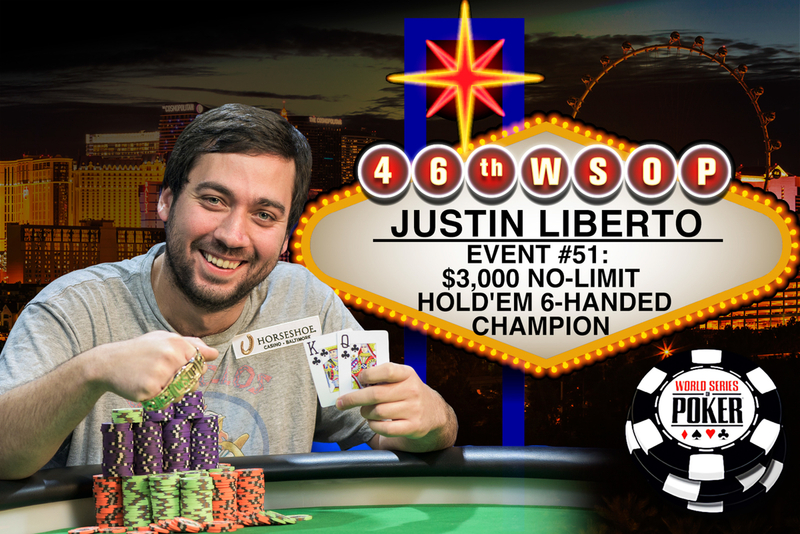 Well, things didn’t just go well at the 2015 WSOP for Liberto. He managed an even bigger accomplishment, a higher payout, and achieved a career breakthrough victory in one of this year’s most competitive tournaments. Liberto won a gold bracelet in the mega-tough $3,000 buy-in (Six-Handed) No-Limit Hold’em tournament, which concluded today at the Rio in Las Vegas. The latest champ topped a tournament field which drew 1,043 entries, consisting of many of the world’s most respected No-Limit Hold’em players from more than 40 countries. The short-handed nature of Six-Handed play accelerated the skill factor, making this title one of the most coveted on the entire WSOP schedule. The total prize pool amounted to $2,847,390. The top 108 finishers collected a payout, with the lion’s share of the money going to Liberto. He earned $640,711 in what was his fifth time to cash at the series. With this victory, Liberto not only crossed the $1 million mark in career earnings, at age 29, he is still free-rolling for what could be another big score and gold bracelet number two in the WSOP Circuit National Championship. Liberto is a graduate of Virginia Tech University. He has gradually moved into the game full-time, starting out slowly at first, never putting his bankroll seriously at risk or biting off more than he could handle. In other words, he’s played his cards right, not just at the table but in life. Liberto has even bigger plans ahead this summer, not including what happens in poker. He’s engaged to be married on July 25th. Meanwhile, Seamus Cahill, from Dublin, finished as the runner up. It looked like Cahill might get the victory when play was heads up and he was ahead in chips by close to 2 to 1. However, Liberto staged a late comeback and denied Cahill the opportunity for a first WSOP win for an Irish player since the year 2007, when two fellow countrymen won gold bracelets -- Alan Smurfit and Ciaran O’Leary (Note: Marty Smyth, from Belfast, Northern Ireland won a gold bracelet in 2008). Cahill collected $395,986 for second place. Second Place: Seamus Cahill, from Dublin, Ireland came in 2nd. He collected a nice consolation prize, totaling $395,986. This was Cahill’s second time to cash at the series, and first appearance at the payout window since 2010. Third Place: Kiryl Radzivonau, from Gomel, Belarus finished in 3rd place. He had the chance to become only the third WSOP winner in history from the nation of Belarus, but busted out just two spots short of the top prize. Nonetheless, Radzivonau enjoyed the biggest payout of his poker career, collecting $251,168 in prize money. Fourth Place: Alexander Delbus, from Lorsh, Germany came in 4th. He was in contention to be the second WSOP winner this year from Germany. He scooped $164,863 from the prize pool. Fifth Place: Cornel Cimpan, from League City, TX posted his first WSOP cash in three years with a 5th-place finish in this event. Cimpan collected $111,475 in prize money. Sixth Place: Benjamin Heath, from the U.K. ended up in 6th place. This was his first time to cash at the WSOP, which paid out $77,591. Had Heath won, he would have been the second winner at this year’s series from England. Seventh Place: Harley Thrower, from Cummings, GA rounded out the official final tables as the 7th-place finisher, earning $55,552 for the effort. Aside from the final table finishers, other gold bracelet winning players who cashed included – Taylor Paur (18th), Rep Porter (19th), Amir Lehavot (23rd), Tim Adams (26th), Leo Wolpert (42nd), Bryn Kenney (44th), Tyler Patterson (47th), Jared Jaffe (49th), Jeff Madsen (53rd), Joe Hachem (66th), Sean Getzwiller (68th), Alex Bolotin (78th), Antonio Esfandiari (86th), Jim Collopy (106th), and Chris Dombrowski (108th). Tom McCormick, a.k.a. “The Shamrock Kid” cashed in this event, which was the 52nd time for his career. McCormick ranks second on the all-time cashes list among players without a gold bracelet victory. Hand 99: Justin Liberto Wins Event #51 and $640,711! Justin Liberto moves all in and Seamus Cahill calls all in. The board comes to make Liberto a pair of queens. Cahill claims Ireland's second runner-up finish at this year's series and will take home $395,986. 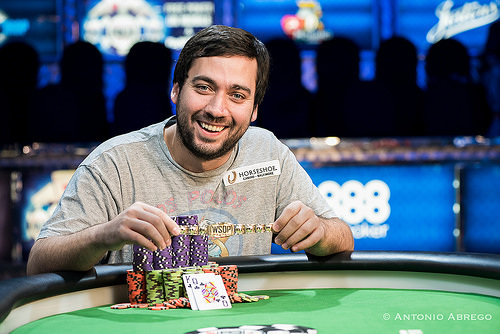 A delighted Liberto wins $640,711 and his first ever WSOP gold bracelet. Seamus Cahill raises to 200,000 before Justin Liberto three-bets to 590,000. Cahill comes back with a four-bet to 1,475,000 and calls when Liberto shoves for 7,480,000. The board runs to hand the huge pot to Liberto. Cahill is left with just 650,000 chips. Seamus Cahill gets a walk. Justin Liberto gets a walk. Justin Liberto opens to 200,000 and Seamus Cahill calls. The flop is and Cahill check-calls 200,000. Liberto fires another 435,000 and that's enough to get Cahill to fold. Seamus Cahill raises to 200,000 and calls when three-bet to 540,000 by Justin Liberto. The flop fans and Liberto leads for 365,000. Call. He calls another 625,000 on the turn before both check the river. Liberto opens and Cahill mucks. Seamus Cahill receives a walk. Seamus Cahill limps in and Justin Liberto checks. The flop comes and both players check. The turn is the and Liberto check-calls 150,000. The board completes with the and Liberto check-calls another 350,000 but mucks when Cahill opens for a full house. 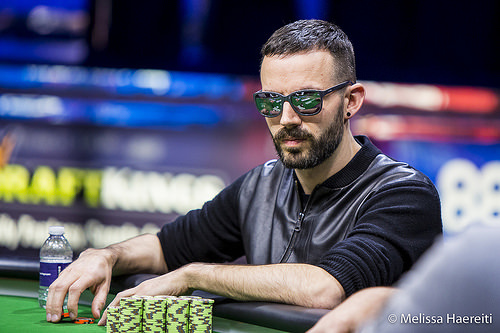 Seamus Cahill raises to 200,000 and Justin Liberto defends his big blind. The flop comes and Cahill check-calls 200,000. The board runs out and both players check it down. Liberto opens and Cahill mucks. Justin Liberto raises to 200,000 and Seamus Cahill calls to a flop. Liberto continues for 175,000 and Cahill check-calls before both check the turn and river. Cahill opens for a pair of threes and Liberto mucks. Seamus Cahill raises to 200,000 and Justin Liberto calls. The flop comes and Liberto check-calls 110,000. The turn is checked through and Cahill folds to a 225,000 bet on the river. Justin Liberto raises to 200,000 and takes the pot down. Justin Liberto folds to a button raise from Seamus Cahill. Seamus Cahill folds to a button raise from Justin Liberto. Seamus Cahill raises to 200,000 and Justin Liberto calls. The flop comes and Cahill takes the pot with a 110,000 bet. Justin Liberto wins the pot with a 200,000 button raise. Seamus Cahill raises his button to 200,000 and Justin Liberto calls. The flop fans and both players check to the turn where Liberto leads for 150,000. Cahill calls and both check the river. Liberrto opened for a pair of jacks but loses out to Cahill's for a straight. Justin Liberto is on the button the first hand and raises to 200,000. Seamus Cahill calls to see a flop and check-calls 165,000. The turn is checked through to the river where Cahill check-folds to a 585,000 bet.